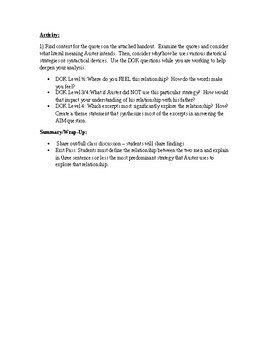 This lesson gives students excerpts from the novel and asks them to analyze those excerpts in attempting to understand the author's relationships with his father. Students will grapple with techniques such as chiasmus, polysyndeton, and passive construction. Lesson is complete with common core standards and DOK (depth of knowledge) questions.